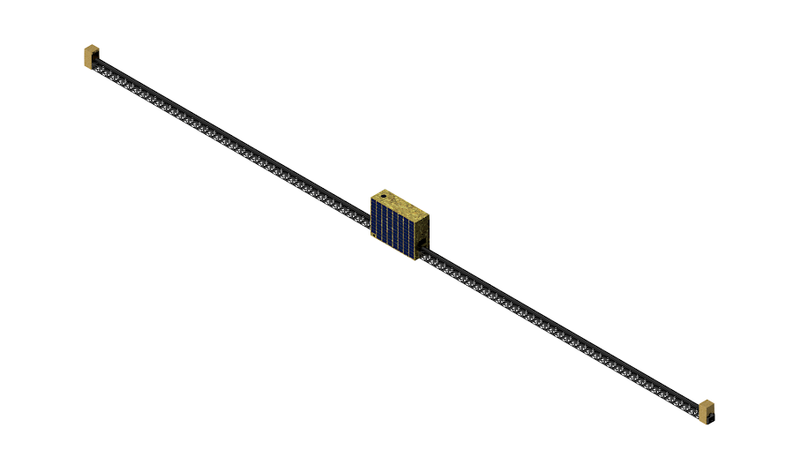 The Optimast-SCI (Structurally Connected Interferometer) satellite employs extended structure manufacturing technology, validated in the Archinaut Development Program, to enable the deployment of an 10-50 meter optical boom interferometer from a 24U smallsat bus. Optimast-SCI relies on autonomous, robotic in-space manufacturing and assembly to create a beam interferometer with high field resolution on an affordable smallsat platform. After delivery to its intended orbit, Optimast-SCI deploys two beams produced by the MIS Optimast system via extended structure manufacturing. Attached to each beam is a mirror assembly with fine position adjustment mechanisms. Optimast is a self-contained, scalable machine for producing microgravity-optimized linear structures on-orbit, developed as a product application of the Archinaut technologies. This use of autonomous manufacturing and assembly enables much larger effective apertures as compared to conventional deployables. Mirrors positioned at the ends of the double boom structure provide a one-square-inch light path – enough light collection and resolution for direct imaging of faint objects in space. The design for the Optimast-SCI system consists of two Optimast extended structure manufacturing machines offset from each other. This enables the use of the Optimast roller gantries to move the boom structures and change the interferometry baseline without the addition of other mechanisms or a complicated trolley system to move each outboard mirror unit along the booms. Light collected from the outboard mirror units is reflected to a central optical system and focal plane within the satellite main bus. A combination of machine vision with fiducial markers and laser guides is used to define corrections in the mirror units due to beam deflection. On an as-needed basis, fine motor controls on the mirrors and in the Optimast gantries align the detection to the most ideal path for the collimator in the main bus. This combination of volumetrically efficient meter-scale space structures with precision light path control provides an approach to structurally-connected optical interferometry in space that is scalable from small satellite missions in the near-term to flagship astrophysics missions. Targets requiring improved limiting sensitivity or higher resolution can be addressed with linear increases in baseline length and mirror size, rather than the geometric increases in complexity generally seen as space observatories grow in size and mission class. Future missions for detecting and characterizing new worlds and faint distant objects require much larger effective apertures than the current generation of space telescopes. Terrestrial telescopes also have large amounts of distortion that blur the viewing of these objects rendering them unusable for in-depth analysis. In-space manufacturing using space-rated polymers provides mission-optimized structural baselines for infrared interferometry missions that are lower in mass and complexity than traditional hinged trusses or deployable booms. An Optimast-SCI satellite optimized for space situational awareness (SSA) and wide-field Earth surface observation is possible with a 50-meter optical baseline. This system has a limiting resolution of only 25 centimeters from a 36,000-kilometer Geosynchronous Orbit (GEO). Such a satellite is capable of both rapid response inspection of satellites and at-will observation of the facing hemisphere. Comets and low surface brightness galaxies can be resolved by increasing the size and number of the apertures on future variants of Optimast-SCI.